Alphalan (melphalan) by Natco is generic version of Alkeran comes in 2 mg and 5 mg tablet forms. A cyto-toxic drug, Alphalan would be useful in the treatment of multiple myeloma (plasma cell myeloma), a form of blood cancer. Multiple myeloma affects the plasma cell, which is an important part of the immune system. In case of persons affected with this disease, the malignant plasma cells accumulate and damage the bone marrow in the spine, pelvis, rib cage and the skull. Alphalan (Melphalan) is a cancer medication. Melphalan interferes with the growth of cancer cells and slows their growth and spread in the body. 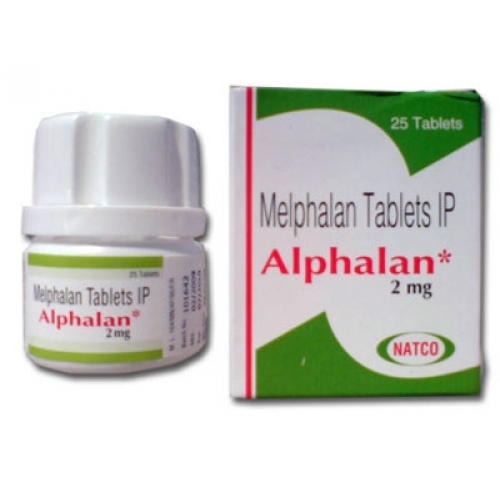 Melphalan is used to treat multiple myeloma (a type of blood cancer), cancer of the ovary, and breast cancer. Melphalan may also be used for purposes other than those listed in this medication guide. Do not use this medication if you are pregnant. It could cause harm to the unborn baby. Use an effective form of birth control, and tell your doctor if you become pregnant during treatment. Get emergency medical help if you have any of these signs of an allergic reaction: hives; difficulty breathing; swelling of your face, lips, tongue, or throat. Melphalan can cause serious side effects, including: decreased bone marrow function and blood problems (easy bruising or bleeding, unusual weakness, fever, chills, body aches, flu symptoms, bloody or black stools, pale or yellowed skin, confusion or weakness); breathing problems; or liver damage (nausea, stomach pain, low fever, loss of appetite, dark urine, clay-colored stools, jaundice [yellowing of the skin or eyes]). Call your doctor at once if you have any of these side effects. In some cases, second cancers have been reported to occur during and after treatment with melphalan. Talk to your doctor about your individual risk and benefit of this medication. decreased bone marrow (from other diseases or medications). If you have any of these conditions, you may not be able to use melphalan, or you may need a dosage adjustment or special tests during treatment. FDA pregnancy category D. This medication can cause harm to an unborn baby. Do not use melphalan if you are pregnant. Tell your doctor if you become pregnant during treatment. Use an effective form of birth control while you are using this medication. How should I take melphalan? Take this medication exactly as it was prescribed for you. Do not take the medication in larger or smaller amounts, or take it for longer than recommended by your doctor. Take the melphalan oral tablet with a large glass of water. Melphalan injection is given through a needle placed into a vein. Your doctor, nurse, or other healthcare provider will give you this injection in a clinic or hospital setting. Tell your doctor right away if any of the melphalan injection gets on your skin or if you feel pain, burning, or other skin irritation when the medicine is injected. Melphalan is usually given for a few weeks at a time, followed by a 4-week period off the drug, during which your blood is tested to see how your body responded to the medication. Your doctor will determine how often you use melphalan and for how long. Follow your doctor's instructions carefully. Melphalan can lower the blood cells that help your body fight infections. This can make it easier for you to bleed from an injury or get sick from being around others who are ill. To be sure your blood cells do not get too low, your blood will need to be tested on a regular basis. It is important that you not miss any scheduled visits to your doctor. Store melphalan tablets in the refrigerator and protect them from light. If you store melphalan injection at home, keep it at room temperature and protect it from heat, moisture, and light. Contact your doctor if you miss a dose of melphalan. Symptoms of a melphalan overdose may include severe nausea, vomiting, diarrhea, mouth sores, bloody or black stools, coughing up blood or vomit that looks like coffee grounds. Do not receive a "live" vaccine while you are being treated with melphalan, and avoid coming into contact with anyone who has recently received a live vaccine. There is a chance that the virus could be passed on to you. pale or yellowed skin, dark colored urine, confusion and weakness. mild skin itching and rash. In some cases, second cancers have been reported to occur during and after treatment with melphalan. Talk to your doctor about your individual risk and benefit in using this medication. The drug is administered as a single infusion over 15 to 20 minutes. Melphalan is administered at two week intervals for four doses, then, after adequate recovery from toxicity, at four week intervals. Usual Oral Dose: 6 mg once a day. After 2 to 3 weeks of treatment, the drug should be discontinued for up to 4 weeks during which time the blood count should be followed carefully. When the white blood cell and platelet counts are rising, a maintenance dose of 2 mg daily may be instituted. Because of the patient to patient variation in melphalan plasma levels following oral administration of the drug, several investigators have recommended that the dosage of melphalan be cautiously escalated until some myelosuppression is observed in order to assure that potentially therapeutic levels of the drug have been reached. Experience with oral melphalan suggests that repeated courses should be given since improvement may continue slowly over many months, and the maximum benefit may be missed if treatment is abandoned prematurely. Other dosage regimens have been used by various investigators. Osserman and Takatsuki have used an initial course of 10 mg/day for 7 to 10 days. They report that maximal suppression of the leukocyte and platelet counts occurs within 3 to 5 weeks and recovery within 4 to 8 weeks. Continuous maintenance therapy with 2 mg/day is instituted when the white blood cell count is greater than 4000 cells/mcL and the platelet count is greater than 100,000 cells/mcL. Dosage is adjusted to between 1 and 3 mg/day depending upon the hematological response. It is desirable to try to maintain a significant degree of bone marrow depression so as to keep the leukocyte count in the range of 3000 to 3500 cells/mcL. Hoogstraten et al have started treatment with 0.15 mg/kg per day for 7 days. This is followed by a rest period of at least 14 days, but it may be as long as 5 to 6 weeks. Maintenance therapy is started when the white blood cell and platelet counts are rising. The maintenance dose is 0.05 mg/kg per day or less and is adjusted according to the blood count. One study by Alexanian et al has shown that the use of melphalan in combination with prednisone significantly improves the percentage of patients with multiple myeloma who achieve palliation. One regimen has been to administer courses of melphalan at 0.25 mg/kg per day for 4 consecutive days (or, 0.20 mg/kg per day for five consecutive days) for a total dose of 1 mg/kg per course. These four to five day courses are then repeated every 4 to 6 weeks if the granulocyte count and the platelet count have returned to normal levels. Response may be very gradual over many months; it is important that repeated courses or continuous therapy be given since improvement may continue slowly over many months, and the maximum benefit may be missed if treatment is abandoned too soon. Available evidence suggests about one third to one half of the patients with multiple myeloma show a favorable response to the drug. Common regimen: 0.2 mg/kg orally daily for 5 days as a single course. Courses are repeated every four to five weeks depending upon hematologic tolerance. Oral: 4 to 20 mg/m2/day orally for 1 to 21 days. or 70 mg/m2/day intravenously for 3 days. If you are using any of these drugs, you may not be able to use melphalan, or you may need dosage adjustments or special tests during treatment. There may be other drugs not listed that can affect melphalan. Tell your doctor about all the prescription and over-the-counter medications you use. This includes vitamins, minerals, herbal products, and drugs prescribed by other doctors. Do not start using a new medication without telling your doctor.